← Are Folding Security Gates A Good Investment? Commercial loading docks, warehouses, industrial service corridors, and industrial unit receiving areas also need to be protected against unlawful entry. Accordion security gates are the top way to do this in many environments wherever chemicals and sensitive goods are stored. These substances may be extremely unstable, creates toxic fumes, or be subject to heat degradation if they are not correctly ventilated. Industrial accordion style security gates obstruct illegal access without blocking air flow. 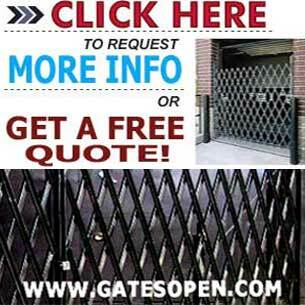 Accordion gates can also manage access to products, intellectual property, and in some cases, protect employee safety. One of the most frequent applications for security access gates is to restrict access to retail supply rooms. Unless an employee is approved access to the stockroom by management, inventory remains safe from inside theft. Intellectual property in businesses can also be secured with accordion gates. Many educational facilities and churches use these gates to direct crowds through their buildings by sealing off select entry points during events. There are both fixed position and portable scissor gates, and a wide range of models you can choose from in each of the three major categories. Call today for more information on pricing and applications. We always furnish FREE QUOTES.